Established in 2005, Dublin-based OpenHydro designs and manufactures marine turbines to generate renewable energy from tidal streams. 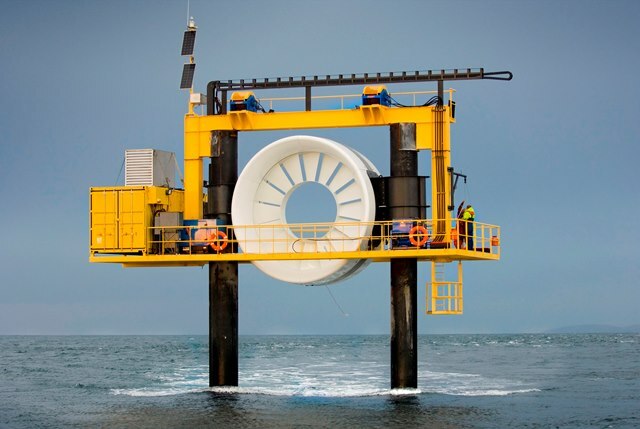 OpenHydro was the first developer to use the tidal test site at the Fall of Warness off the island of Eday when its test rig and 250kW open centred turbine were installed in 2006. The device was the first tidal turbine to be grid connected in Scotland and subsequently the first to successfully generate electricity to the national grid in the UK. The test rig consists of two steel monopoles grouted into sockets drilled into the seabed, with a platform suspended from the piles to provide a working area. The turbine, which is six metres in diameter, is fixed to the piles using two steel collars, which allow the unit to be lowered into the sea using two 15 tonne hydraulic winches. The test rig allowed the turbine to be raised out of the water easily, reducing the cost and time for testing, maintaining and updating the device. To aid navigation, the test rig is painted yellow and yellow light (solar powered) is fitted in accordance with NLB requirements. The platform is also equipped with an AIS transponder. As the Open-Centre Turbine was designed to be deployed directly on the seabed using a gravity base, OpenHydro placed a blank, non-grid connected turbine on the seabed adjoining their test rig using the specially commissioned “OpenHydro Installer” in summer 2008. Whilst progressing larger demonstration projects in Canada and France, OpenHydro continued to bring subsequent generations of their device for testing on their test rig at EMEC. Their 7th generation 6m diameter turbine was installed in their test rig in April 2014 and accrued over 10,000 hours of run time. Unfortunately, in July 2018, their parent company, Naval Energies, made the decision to liquidate the company. What challenges were you facing prior to testing at EMEC? Prior to testing at EMEC, we lacked the facilities to test, refine and prove our technology at scale in a real live tidal environment. Since we started testing at our EMEC platform in 2006 we have gained invaluable insights into how our technology operates in the marine environment in real time; something which cannot be fulfilled through other forms of modelling or lab testing. Why is it important to test in real sea conditions? It was important for us to test and validate our technology, as well as to improve efficiency and performance through our work at EMEC. We also were able to test our components and sub-components and how they would function in a real marine environment. Testing at a facility such as EMEC is important not only in terms of refining our turbine and power system, but also more broadly in terms of showcasing our technology to potential investors and clients. How has your time here at EMEC helped resolve these problems? Our research structure at EMEC has proved to be a key facility for us. The intelligence we have gained through our highly instrumented turbine has given us important insights into loadings, turbine performance and maintenance. It has also provided us with important environmental monitoring information on how marine life interacts with our technology. Our turbine system at EMEC is easily accessible, allowing us to inspect the turbine and turbine components at regular intervals. We regard our work at EMEC as being an important step in the OpenHydro journey. In December 2015, our latest turbine at EMEC passed the 5,000 hours generated into the Orkney grid milestone. In addition to this, we have secured efficiency improvements in the region of 16% through the work we have done to refine the turbines control system. The power conversion system and components we have used at EMEC during the last few years have provided us with validation for the power conversion technologies we are using on our projects in Cape Sharp, Canada.